The new Xbox 360 "slim" has a built-in shutdown mechanism that will automatically pull the plug on the unit if it overheats before it suffers permanent damage. Last week's news that Microsoft had solved the Red Ring of Death problem on the new Xbox 360 "slim" by getting rid of the red rings was good for some laughs but the question of what had been done to address the underlying issues remained unanswered. So it remains, but there is some good news: The new 360 will give users a heads-up that there's a problem and then shut itself down, presumably before its brain boils past the point of recovery. 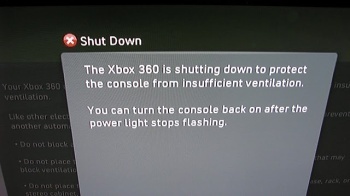 An image posted on NeoGAF shows a message warning, "The Xbox 360 is shutting down to protect the console from insufficient ventilation. You can turn the console back on after the power light stops flashing." So the Red Ring of Death has apparently morphed into the annoying but far less destructive Red Dot of Inconvenience. How the unit will actually perform under real-world conditions remains to be seen; Microsoft said at E3 that the red ring problem had "pretty much gone away," which isn't exactly a rock-solid declaration of victory, but at least new 360 owners will have a chance to rectify their heat problems before a trip to the shop becomes necessary.